Scotch thistle “forest” in the honey lake valley. Seeds were set and disseminated, it will be a long battle at this site. Recently I was a participant on an educational noxious weed tour in Sierra Valley. It is a beautiful mountain valley where most agricultural production is devoted to grazing and hay production. The tour was set up by the Plumas Weeds group, to show land managers and ranchers various noxious weeds which are invading Sierra Valley. 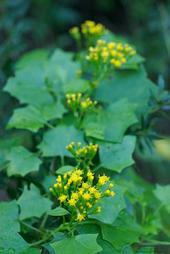 We discussed identification, biology, and control options for a variety of weed species. One of the questions which was inevitably brought up for each species was: “How long is the soil seed life of this weed?” This question led to interesting conversations. The Economist reports that Hungarian biologists have trained rabbits to preferentially eat common milkweed (Asclepias syriaca), an invasive plant (and a native to North America).